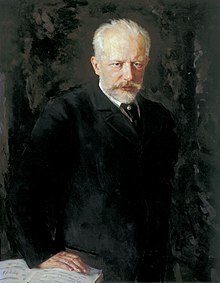 Pyotr Ilyich Tchaikovsky o Peter Ilyich Tchaikovsky (25 Epril/7 Mei 1840 – 25 Oktomba/6 Novemba 1893) em i bin wan man blong miusik blong Rusia. ↑ Rusia long 19th century bin yusum wan narafala calendar. 25 Epril 1840 - 25 Oktomba 1893 ol i bin kaen date blong bifo. This page was last edited on 25 Novemba 2017, at 09:36.